The Dorking is thought to be one of the oldest British chicken breeds descended from original birds brought to Britain by the Romans. They get their name from the market town of Dorking in Surrey which became one of the main areas of production in the nineteenth century when they were popular as a table bird. The Dorking is a docile breed making good brooding hens. They like to range freely and lays white shelled eggs in moderate numbers. 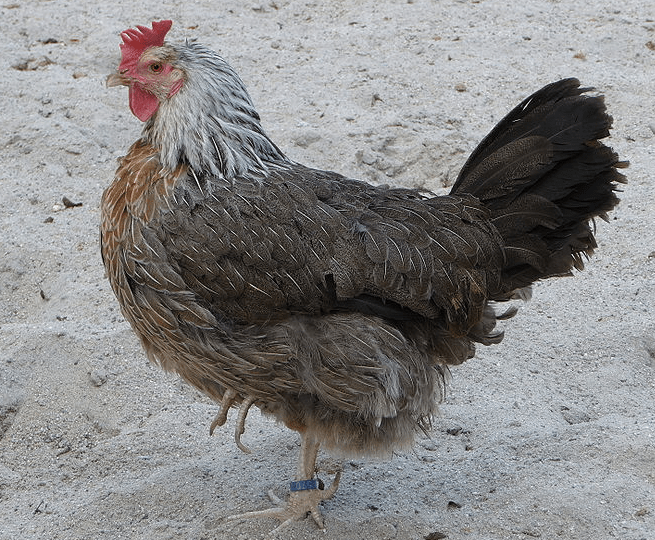 A silver grey bantam version exists which is one quarter the size of the standard birds. Dorkings take about two years to mature to an average adult male weight of 4.55-6.35kg (10-14lb) and female around 3.60-4.55kg (8-10lb). There are currently over 100 members of the breed club and surveys are taken every three years in order to conserve this ancient breed. Records suggest that Dorkings appeared in the first British poultry show in 1845. It is thought that the Sussex breed of chicken is derived from the Dorking.